Malcolm Martin, a NYC harbor skipper and a friend of the project recently asked me whether the dust had settled yet, or whether a whole new cloud of dust is arising in preparation for 2014. A good question. If there’s one gift I value most about long nights and warm fires it’s the gift of perspective that a pause can bring. If you live in a totally mild climate where nature never forces you to just….stop…..then I guess I might feel a little sorry for you. So you already know that I have major props for my team. We pulled out all the stops. Most participants were barely compensated, if at all. This project was brought about by fire in the belly and by the conviction that ordinary people working together can bring about creative, cooperative solutions. If we had put everyone involved on payroll of any kind, you can be sure either the project would never have happened or else we would be so bankrupt that the boat would never see the water again after this year. But this should come as no real surprise. Our 2013 voyage was a statement, an experiment, an effort to explore and to suggest new ideas in a way that our major institutions are unlikely to ever do. As such, we succeeded. We did something that has been long talked about yet hasn’t really been acted on, at least not in our Northeastern waters. It cost us a lot. In general the greater the commitment, the greater the cost for the individuals involved. But we did what we set out to do, and in a world of broken promises, I think that’s worth something regardless of what follows. Still, lots of folks want to know, “Hey, this sounds cool and all that. But did it make any money?” My answer is no, not really. However we did basically break even for the trading voyage, which for a start-up in its first year is not bad at all. Also, now we have the data to steer us towards a better model. It may take us a while to get there. Keep in mind that we are dealing with a wickedly tilted playing field. Road transport is artificially cheap, paid for invisibly through your tax dollars in so many ways. As a lot of folks are already aware, that the price of road travel at the toll booth and the pump is a small fraction of the cost. But you might not know that small-scale marine transport is, at least in in our case, artificially expensive! We have an insurance policy that costs more in premiums each year than it cost our team to build Ceres from scratch (materials bill $17000). Without this policy we can’t tie up to many docks. It costs this much simply because we are commercial and the handful of remaining marine underwriters consider us to belong to a high-risk pool. Today’s marine insurance sector is very, very heavily consolidated and only three underwriters, all gigantic, would even consider covering us. Of those three, only one was ultimately willing and able to offer us a policy that met our needs, but at a price tag that is, at least for our scale, quite onerous, in excess of $20,000 per year for all of the various required policies combined. And consider that if Ceres were the exact same boat sailing the exact same places but classed as recreational rather than commercial, the policy would likely be only a few thousand per year, max. It is not fair, but exhaustive research left us with no alternatives. I could also add that our agent, S and P Underwriters of Montpelier, did their utmost to secure us a fair deal but ultimately were limited by their underwriters. It took unreasonable amounts of time and patience to even get a quote, during which time we built and launched a sound vessel in good faith that we would ultimately negotiate an affordable policy that met our needs. So, there we stood in September, with Ceres built, launched and ready to sail, and confronted with the choice of abandoning the entire project before we could sell a single pound of cargo or making the commitment to carry heavy insurance burden for a one-year minimum…well, we went with our gut and chose the latter. We were–and we remain–convinced that we have a legitimate right to ply the water in trade. We’re in it to win it. I also believe, sooner or later, one way or another, that the insurance issue will resolve itself. Either we’ll develop enough revenue streams to cover the cost, or maybe once we prove to our underwriters that we are a dependable client, that we are cautious, and that we solve our own problems (evidenced on numerous occasions on our first commercial run), and eventually our insurer will lower our premiums to a more reasonable level (and if anyone reading this has the wherewithal to help defray this single vexing expense and in so doing, tilt the playing field back to something approximating fairness, please let me know!) At the end of the day, there are no blueprints out there about how to negotiate an endeavor like this into existence in the “real world.” We can only do our best. Sometimes our best isn’t even good enough for ourselves. Let me tell you about an aspect of the fall voyage that was and remains a keen disappointment to me. We didn’t sail nearly enough. The majority of the beautiful trip was spent with the rattling of the Mercury outboard in the background. That motor that was intended to be in the background for backup use only took center stage time and time again. Why? Well, I have a lot of excuses. We didn’t have any base of experience know how long it would take with this craft, this rig, this load. We had a very demanding timetable, with logistics and media waiting for us at nearly every stop. We had to hit out deliveries on time and be back home through the canal system by November 15th. And on the way down, pleasant southerly winds were in our face most every day, only to turn northerly the moment we set for home. So, all together, this wasn’t at all what I had in mind as a demonstration project for sail power. So let’s just ask this question: what if everything about the project could be adjusted so that we could pay a crew and make money doing the same run in the same way as we did last October, under power most of the time? In fact, let’s take it one step further. You could cut to the chase and strip the masts and sails off the barge and thus simplify everything–simplify it a lot! Would we do it? The answer is no. If we can’t make adjustments to make greater use of wind and muscle and still serve some useful economic function, then I say the hell with it, I’m not interested. So maybe that means that some less dogmatic person comes up behind VSFP and launches a motor-only-minifreighter delivery service/floating farmers market, taking advantage of the market we have proved is there? I say, that’s great. That’s not a business I’m interested in running, so anyone is welcome to it. I think it’s a fine idea for someone to pursue, but motors are of no interest to me, so someone else would have to do it. However I feel like it needn’t come to that. The learning curve to getting the most out of our sailing barge and other craft like her is a long one, and an interesting one. I want to keep climbing it, at a pace I can sustain on a personal and financial level. After all, nothing truly worthwhile can be learned in a single season. We’ve only begun to explore the potential of our new barge, and have lots of ideas based on our experience to improve performance and function. Most notably a new folding bowsprit and the long-awaited completion of our upper sails! Collaborate with Bread and offer Puppet Theatre in Lake Champlain to offer “Shipboard Theatre”! Please note that part about remaining volunteer-driven. This means we still invite your help to stay sailing. There will be opportunities for volunteers to crew aboard or even skipper Ceres (so long as standard qualifications and training protoc0ls are satisfied). Get on our mailing list to learn about that. We’ll also continue to invite general financial support for the work we do and to also offer you the opportunity to support us simply by trading with us. Putting a bulk cargo aboard (dock-to-dock rates start at $.25/lb) and shipping it from one Champlain-Hudson waterway port to another is yet another way to support us. We’ll also be refining our pre-order and pop-up market systems and of course patronizing those anywhere we go is fantastic too. Okay. I have this goal, an easy and lighthearted goal, that you can help me with. We have 98,600 views of this blog to date. Please share this blog with your friends and help me over 100,000 before 2014 arrives! When Captain Steve (Schwartz) began to get acquainted with the project and learned that he’d be working with me and first mate Jordan Finkelstein, he started to get excited about a lot of things. The funniest of them was maybe this exclamation. “What are the odds! 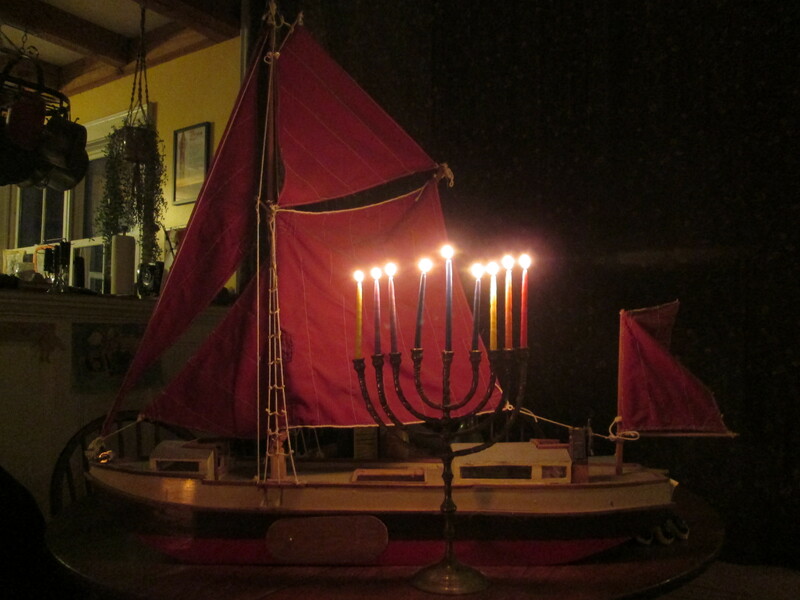 Three jews sailing food down the Hudson River!” I think it was the menorah on my piano that tipped him off, as we were in my house at the time. But I had to tamp down his enthusiasm a little, saying I am really not that much of a jew. Though I enjoy a seder every year and we do hannukah with the kids, I am really a lapsed Quaker if I am anything at all. Still, it was a funny moment, one that stood out in an endeavor replete with funny moments. And now with Thanksgivukah at a close, the first and last Thanksgivukah any of us will ever know, we give thanks for the Mayflower, the perky little ship that helped the Pilgrims sail from Judea to escape the religious oppression of the Seleucid Empire, and for the Maccabees they met in the New World who saved them from starvation by teaching them how to make latkes and jelly doughnuts, and how to properly cook a turkey brisket, and of course for the oil that unexpectedly lasted the pilgrims through their entire first winter in Massachusetts, and many things besides. I personally am especially thankful for the support and understanding of my family as we pulled this thing off and proved our point, an undertaking that did more and demanded more of us than we had imagined at the outset. I am thankful for the many partners who helped pull this all off, too. We made many great connections along the way, including Chipman Point Marina, the City of Mechanicville and Southern Saratoga Chamber of Commerce, Transition Albany/Troy, the Hudson Sloop Club, the Hudson Maritime Museum in Kingston, Riverside Marina in Newburgh, the Beacon Sloop Club, Hook Mountain Yacht Club, the Science Barge in Yonkers, the Sloop Clearwater, Brooklyn Navy Yard and New Amsterdam Farmers’ Market. What a roundup! I am thankful for the help Greenhorns USA gave us in filling gaps in our organization as we plied our route for the first time, and for help in getting the word out. Greeenhorns works tirelessly to advance agrarian revival and the interests of the next generation of farmers. If you are passionate about these issues that are so vital to the future of our region, take a look at Greenhorns’ ambitious program and please consider supporting them. Lastly and most importantly, Vermont Sail Freight Project owes a huge debt of gratitude to our sponsor the Willowell Foundation, whose director Matt Schlein went way out on a limb and took a chance on my vision of a Lake Champlain and Hudson River repopulated with working sail. Willowell has wrangled volunteers, helped with countless hours of administrative support, has provided financial security and support to the project. As project director I pledged to seek funding to get the project off the ground, but did not fully succeed in this and our venture still struggles with unfunded project creation costs. We have been unable to offer much compensation to those who worked so hard to bring the project about. And particularly due to our high insurance costs, Willowell continues to carry a fiscal burden but yet has refused to abandon the Vermont Sail Freight Project or to drastically reduce it in scope. So, if Thanksgivukah or the coming of Christmas has put you in a giving frame of mind, if the voyage of the Ceres has brought a sense of adventure and hope to your year, please consider supporting them as we have high hopes to carry on in 2014 and still need support (tax-deductible)! In fact if you are in our area you can come to the Willowell Annual Fundraiser at the Vergennes Opera House this coming Saturday, December 14th. BandAnna is playing and it will be a fantastic time. We will be auctioning off some dinner tickets and a cruise aboard Ceres in 2014! Hope to see you there and Happy Holidays! On one last note, this blog is so close to the 100,000 views mark! 97,000 to date! Tell a friend and help us claim that accomplishment by New Year’s Eve!